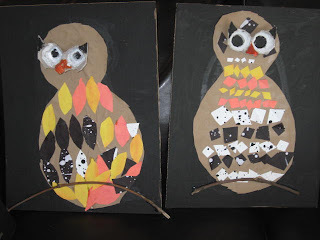 These cute owls were created thanks to a great post from That Artist Woman. We used recycled cardboard for the background, brown package paper for the bodies, egg carton eyes, splattered construction paper feathers and finish with 2 real feathers(not shown here) for the wings and a branch to perch on. 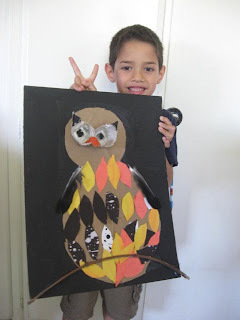 A fun project for Fall!